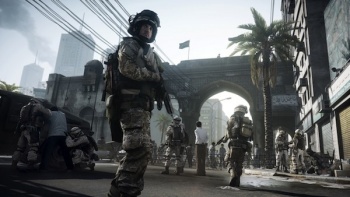 Battlefield 3's producer delivers some undisguised criticism of Activision's yearly shooter releases. Electronic Arts and Activision are the two largest third-party publishers of videogames so there is going to be some animosity between studios working for either side. Arguably the most intense arena of competition between the two is the shooter genre, with EA's Battlefield and Medal of Honor franchises on one side and Call of Duty on the other. Patrick Bach from Swedish developer DICE doesn't think that EA would ever force his team to produce a game every year because that would result in low-quality product. Bach also dismissed the notion that another studio could step in to handle development every other year like Activision has done for Call of Duty. "We need the time to be able to create the next game that consumers will hopefully like," Bach said. "If we were to release another big Battlefield title next year, that would mean that we'd have less than a year to build it, and that would mean that we'd have to have another studio building it for us, which would mean it wouldn't have that DICE seal of approval, which would mean they'd just have to release a copy of the game we just released. Bach is confident that his publisher would never force that kind of schedule on Battlefield. "EA would never force us to release a game every year. I think that would dilute the vision of the franchise, and you will eventually kill the franchise by doing that," he said. Bach didn't rule out that EA was interested in releasing Medal of Honor and Battlefield games on a revolving annual schedule, but that he would never allow another studio to touch DICE's franchise the way that Infinity Ward and Treyarch do with Call of Duty. "That would be the day. I know for sure that there aren't any discussions about doing that," he said. "That would be the killing blow for the franchise." Man, he certainly talks a lot about the Battlefield franchise dying and being killed. I suppose that's a necessary character trait when you make games involving shooting and killing as many people as possible. But Bach didn't escape the interview without a few more backhanded comments about his competitors at Activision. "What we noticed with Battlefield: Bad Company 2 was that if you spend enough time on making an expansion pack like Vietnam there's enough content to make it feel new and fresh. It's not only a map pack, it's weapons and vehicles, and it makes the game feel fresh again," he said.